Oh the joys of summer – long, quiet days without the rush of students. It’s a great time to get caught up on all of the projects that were neglected during the school year. However, while you’re playing catch-up, you may find yourself spending a great deal of time sitting at your desk or work station. For a few quick tips to make sure you’re sitting safely, click on the flyer on the right. You’ll also want to check this month’s “Spot the Hazard” to see if your work area contains any potential safety risks. Scoot back in your chair for the best support. Adjust chair height so your feet touch the floor and your knees are equal to your hips. Use a footrest if needed. Recline the backrest to 100° – 110° and ensure both your upper and lower back are supported. Invest in a lumbar support to improve stability. Keep your wrists neutral by bending your elbows at a 90° angle. 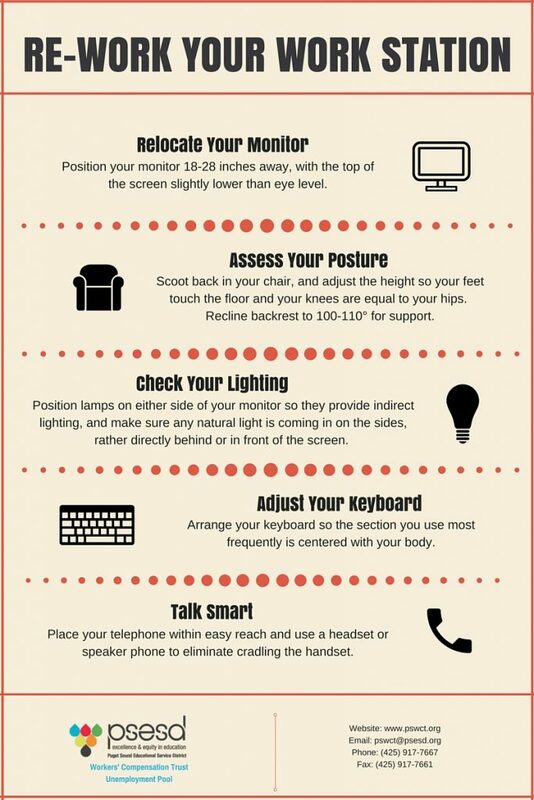 Place your monitor 18-28 inches away, with the top of the screen slightly lower than eye level. Position lamps on either side of your monitor so they provide indirect lighting, and make sure any natural light is coming in on the sides, rather than directly behind or in front of the screen. Adjust curtains or blinds as needed. Determine what section of the keyboard you use most frequently, and adjust the keyboard so that section is centered with your body. Resist resting on wristrests while typing. Place the pointer or mouse as close as possible to the keyboard. Place your telephone within easy reach.Telephone stands or arms can help. Stand and stretch at regular intervals. Inactivity can impact blood circulation. Take short 1- to 2-minute stretch breaks every 20-30 minutes.After each hour of work, take a break or change tasks for at least 5-10 minutes. Always try to get away from your computer during lunch breaks.